A seen in an Inner North Park this morning. They might have cut away the whole tree. They might have poisoned the stump. But there’s something alive down there and it’s not giving up just yet. Though that’s an old chestnut. I’ll leaf now, retaining my feeble composture. I hope whoever poisoned the stump didn’t get paid. 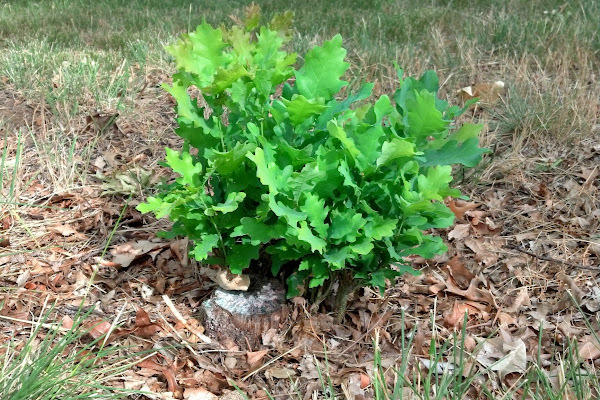 Hope the Oak tree is allowed to grow in peace. They’re very tough, but also quite slow-growing, but having the old tree’s root system might give it a head start. Nature continues to amaze me. Grass and weeds push up though the smallest cracks in the cement. Things grow and prosper where people have tried to destroy. Thats the nature of nature…….